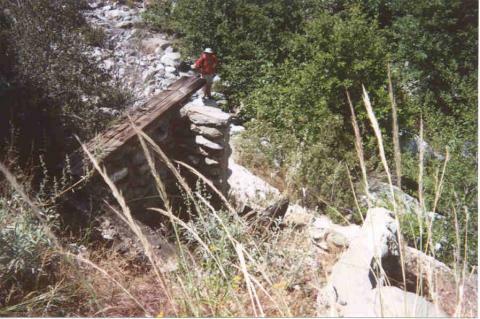 In the October 2005 Explorer, the writer included the Native Son Mines among local mines we will probably never see, since the 11 mile long Blue Ridge Road leading to the mines (just west of Wrightwood off the Angeles Crest Highway) was closed several years ago by the Forest Service. However, this closure was temporarily lifted in October permitting hikers to now drive to Lupine Campground which is within three miles from the end of the old road at Cabin Flat Campground (now unmaintained) and two miles from the mines. Numerous fallen tree trunks now block the road at that point. 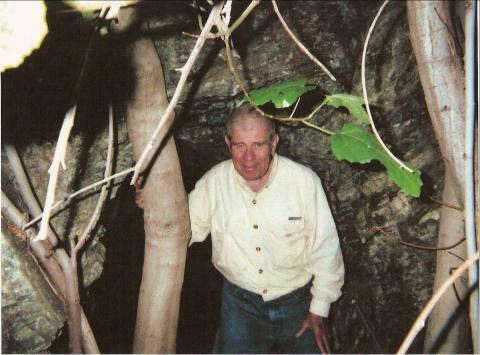 In November, a dozen Grotto members took advantage of this narrow window of opportunity to visit the area and find two of the mines. A few days later the road was closed again until next summer because of snow making operations at the Mountain High Ski Area. 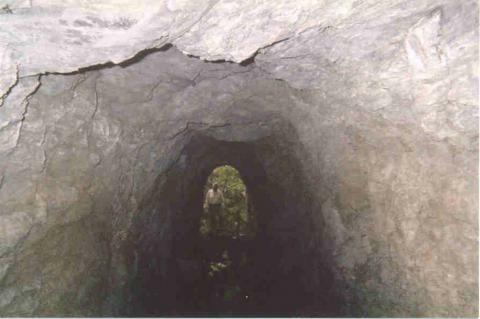 The most interesting mine has well over 300 feet of walking passage that goes in straight as an arrow. 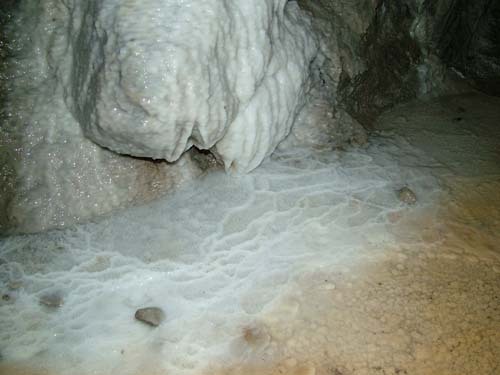 Toward the end of the mine, there is a few inches of limestone-saturated water that contains cave pearls, small rim stone dams and stalactites, as well as flowstone. 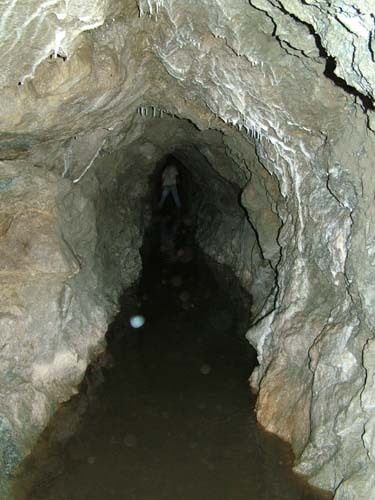 A second mine was dry, with an estimated 250 feet of walking passage. There were originally six tunnels, reportedly worked on and off from 1897 to 1920. Access to the mines was by an old miners trail along the southern slopes of the East Fork and by trail from the desert up Big Rock Creek and then down Vincent Gulch. The Blue Ridge Road was not constructed until the 1930’s as part of the attempt to develop the Big Pines Park by the Los Angeles County Department of Parks and Recreation. In October, several Grotto members explored the Black Cargo and Lucky Strike mines near Monte Cristo Campground on the Angeles Forest Highway. 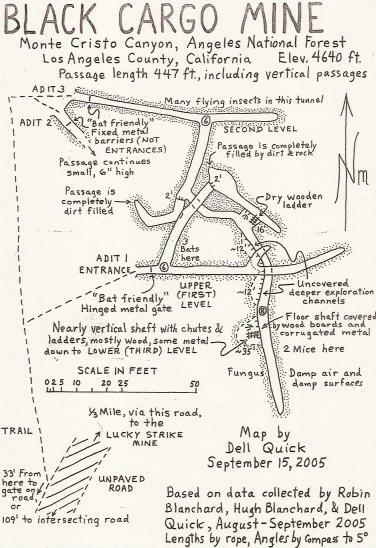 Dell Quick mapped both mines, whose entrances until recently had been closed for many years. 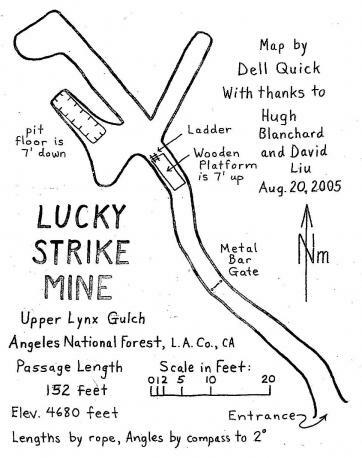 The Lucky Strike, which is the last hard rock gold mine still operating in L.A. County, has one level with a passage length of 152 feet. The Black Cargo, worked until 1998, has three levels, including a 50-foot shaft totaling 447 feet. Several bats were observed. The entrance to the Gold Ridge Mine – near the Mt. Baldy ski-hut (see March 2005 Explorer) was completely covered by gravel and rocks from last winter’s record-breaking rain and snow. In September, several Grotto members helped uncover the entrance and two members (Curt Wheeler and David Lew) braved the chest-high cold water to reach the end. They estimated its length at about 150 feet. 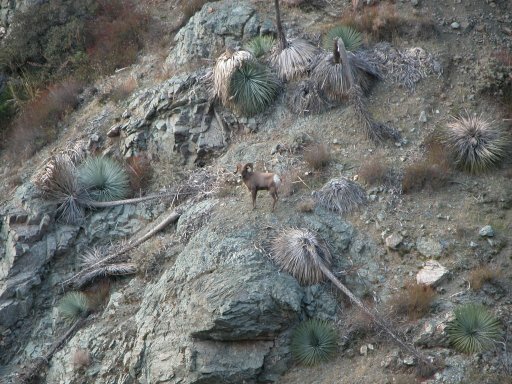 A big horn mountain sheep was observed near the dig. The mine was last worked in 1907. 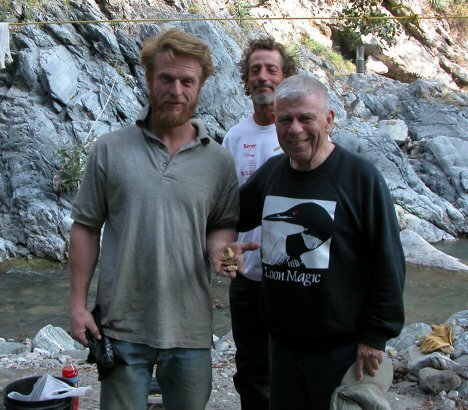 Major rediscoveries were also made last month on the East Fork of the San Gabriel River just below the Bridge. 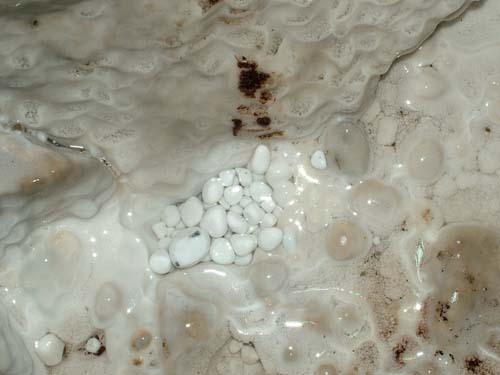 The Horseshoe Mine was rediscovered last year,(see October 2004 Explorer) and an October Grotto trip discovered an additional 150 feet of walking passage near the end of the mine, as well as a small upper level . This increased the total length of the mine to around 400 feet. 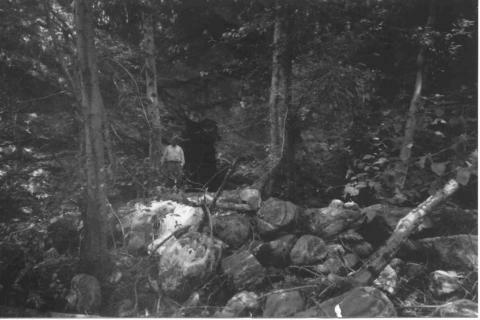 On the same trip, the long sought Horseshoe Mine Annex was also found and explored. More than 500 feet of passage was found. 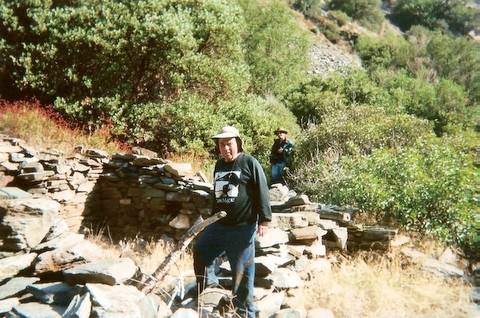 Eric and Mike Bull played a major role in both discoveries. Neither mine has been worked since the 1930’s. The following week, a trip was made to Iron Fork, a mile beyond the Bridge. We saw several old-time miners who let us examine their gold nuggets and also viewed the remains of the century-old cabin of Oliver (Old Hickory) Justice, once the patriarch of East Fork miners. We also studied the trails that lead up to the Stanley Miller Mine. During the return trip, we saw several big horn mountain sheep near the Bridge. 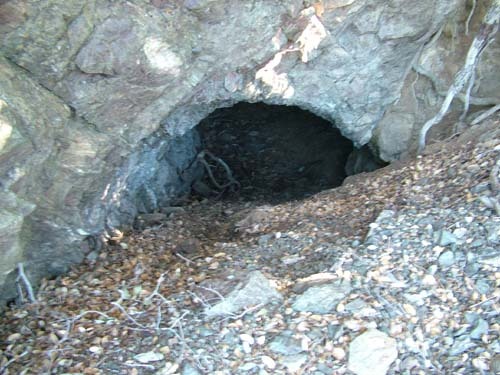 The Emma and close-by Emma Annex – both old copper mines on Soledad Canyon Road near Acton (See June 2005 Explorer), were explored and mapped by Dell Quick in September. The Emma’s length is 312 feet and the Emma Annex is 278 feet. A nearby shaft has an estimated depth of 25 feet but has not yet been bottomed. Bats have been observed in the Emma Annex. Several additional clogged mines/tunnels have been opened in recent months in Las Flores Canyon in Altadena . the golden age of mine rediscovery in Los Angeles County. Grotto members involved on these trips include Eric and Mike Bull, Curtis Wheeler, Daniel and Betty Veelik, Richard Collier, David Lew, Roger Brown, David and Dorothy Bowman, Dell Quick, David Campen, and the writer.